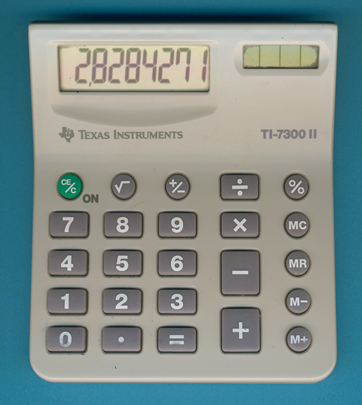 Size: 4.8" x 4.2" x 0.9"
We wrote the year 1989 when Texas Instruments started the US-built campaign. Together with the TI-7300 other models like the TI-7000, TI-7100, TI-7200 and TI-7400 were introduced for Wal*Mart and other discounters. And all carried the "Made in USA" logo. If you read the small printed on the back of the calculator you'll notice the sentence "With foreign and domestic components". This TI-7300 II was introduced in 1994 as the successor of the revised TI-7300 and matches the design of the TI-7000 II and TI-7140. This trio seems marks the last Lubbock-built calculators, they were introduced and manufactured in 1994! Don't miss the TI-8230 printing desktop calculator manufactured in the U.S.A., too. © Joerg Woerner, February 19, 2012. No reprints without written permission.